I've got a list longer than my arm of all the things I desire. Here's my top 3 for now. Unfortunately, I have an expensive taste so these come with an exorbitant price tag. I call "investments" (ok, I'm sensible to understand that we're not talking about bonds, shares or properties etc here) as they are timeless classics and will never date. Until I've tried on a Rick Owens leather jacket recently, I've never understood why many eulogize and extol the virtues of a piece of clothing. I mean, for heaven's sake, it's just a leather jacket. Well....until I tried one on. It was like ahhhh..... revelation. I've never worn a leather jacket which fits so perfectly on my shoulders AND waist. I look like I have an amazing figure. Anything that hides all the wobbly bits and accentuate the positive gets my vote. When worn unzipped, the cascading lapels fall beautifully to the side changing the look of the jacket completely. The cut and tailoring are infinitely impeccable. Rick Owens is a genius! This jacket is way up on my wish list. I've worn my black trench coat which I picked up from the back streets of Hong Kong to bits. I bought it so many years ago for a measly £30 and it holds up unbelievably well. What I don't have is a beige or taupe trench coat. I picked up one from Debenhams Petite range but hubby loathed the sight of it. The Zara version with puff sleeves didn't hold up too well. I've been eyeing a Burberry trench coat for the longest time. I tried one on not too long ago and it was love at first sight. I need this for spring! I've come to the realization that the real McCoy's the best. 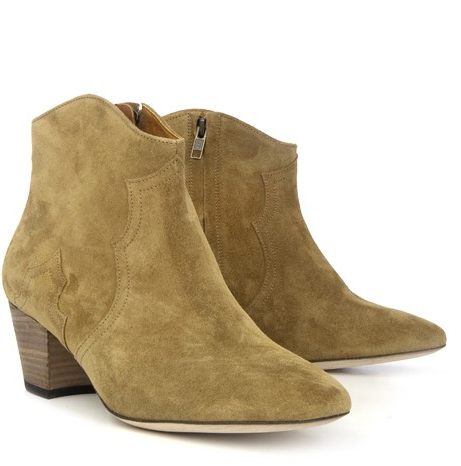 I've purchased the Topshop ankle boots but the fit isn't all that fantastic on my tiny narrow feet. It pains me to say this but sometimes one just has to spend the money to get the best without resorting to the cheaper alternative. I can only hope these boots come in my size. Yum! Not surprised that your short list is nearly the same as mine! I fear trying on the Rick Owens jacket for my own sanity! lauraloo, try it! I'm evil, aren't I? *cackle* I kid you not when I say that the cut is divine. featherfactor, I'm in lust over that jacket. Haven't stopped thinking of it. The only thing is I read on TPF that the sizing is a little ambiguous. Speaking of which, I hope you don't mind me linking your blog to mine. That way, I don't have to go around searching for your post to find the URL. You and me both, Heather. Finding the right fit is harder than I'd ever imagined. Have you ever tried Ted Baker Roark leather jacket? It's fantastic but far cheaper. The beige Burberry trench coats are a MUST! I love my Buckingham model in honey color to bits! It's the perfect style for petites and I found the honey color suited my skin tone best. Buckingham model? Okay, I'll keep my eyes peeled for it. I've seen a ton of them at the outlet stores but I was in such a hurry that I didn't get the chance to try size UK6. I was stunned to find the size UK8 was too big. I'm not THAT small!